Packed with entertainment. Packed with new technology. Packed with opportunity. It’s quite a rush working at Paddy Power. Our light, bright, buzzing stores are filled with interactive media and up to 20 screens showing thousands of live sporting events. They’re also packed with people. The regular customers who you’ll get to know like family, and your team – knowledgeable, upbeat and ready for a challenge. Thanks to our Retail Academy, and large network of stores, there are few better places to build a career in retail. We’re serious about the training and development of our people, making sure they’re always at the top of their game. We’re constantly developing brilliant ways to keep our millions of customers entertained and creating career opportunities for our people – and you’ll get to be at the forefront of it. You up for it? Read on. Entertainment. That’s what our customers are looking for, whether they’re having a flutter on the races or playing on our self-service betting terminals. They also want a warm welcome, a fair deal, quick service and someone with a bit of know-how, who can tell them about our products. You’ll make sure they get it all, whether you’re taking a bet, sharing a joke, answering an odds-related query or explaining one of our new products. You’ve got loads of get up and go. Efficient, organised and quick on the uptake, you know how to make sure stuff gets done. Our shops are like a community, so you’ll need to be able to build a friendly environment and understand your customers so they can have a great time. It can be a rollercoaster of emotions watching and betting on live sport, but your calm, friendly approach will ensure the atmosphere always stays warm. Ideally, you’ll have some retail or hospitality experience under your belt, but if you’re brilliant with customers and have business know-how you’ll fit right in. To be a Team Leader or Senior RBA for us you’ll need to be a role model in-store for others, representing PPB at its best to our customers. From the start, you’ll be on track to be a Duty Manager, becoming responsible for all shop operations and acting as the senior member of the team in the absence of the Shop Manager or Assistant Manager. You’ll be a natural at working with others, not just the customers that walk through the door, but all your in-shop team members. That means you’ll need to be friendly, but also quick-thinking and able to take the initiative. Others look to you, because you’re always the one with a plan or bright idea. You’ll be on the ground making sure everything runs smoothly, ready to deal with whatever comes up and working tirelessly to ensure your store is as fun and welcoming as it can be. When the manager’s away, you’ll keep things running smoothly – opening and closing the shop on time, and taking responsibility for everything in between. You’ll create a buzzing atmosphere that keeps customers entertained, builds the business and boosts profits. Whether you’re ensuring your team knows about the latest multichannel offers, or how to attract new customers, you’ll help the business go from strength to strength. You’ve got experience of leading a team in delivering great customer service face-to-face, most likely in the retail or hospitality industry. You also know how to listen – to what your customers want, to what makes your team tick and to the great new ideas and initiatives arriving in your shop from our marketing and product teams. What’s more, you understand how to put it all together to create a buzzing atmosphere – and strong profits too. This is a serious business, but lots of fun too. You’ll get to know exactly what your local community wants from a betting shop – and then create it. You’ll be equally good with your team, finding the best people and bringing them along with you to make sure they’re up to speed when it comes to new promotions and tech. From ensuring bets can be settled and taken with lightning speed to growing your customer base, you’ll be invaluable in every way. You have endless energy. You strive to keep improving, to keep learning and to keep curious. You handle any setback in stride. And you have plenty of experience managing a team. You’ll also take pride in delivering excellent customer service, as well as all the business essentials, and you’ll be a born leader who can set high standards and create teams that run like clockwork. With over 600 shops across the UK and Ireland, and new products, new tech and new initiatives launching all the time, we need people out on the road, as well as on the high street. District Managers. Operational leaders. Construction Managers. They’re all helping us drive forward a FTSE 100 business where the pace of change is relentless, and the possibilities for development in retail and beyond are endless. We’ve got amazing tech here at Paddy Power. We live-stream over 100,000 sporting events every year. Our stores are packed with the most advanced (and exhilarating) gaming technology. And we’ve got more interactive multimedia gizmos than you can shake a selfie stick at. We’ve got a mischievous streak at Paddy Power. We can’t help it. So maybe we flew some giant pants over the course at Cheltenham one year. And sent a Mexican mariachi band to meet Donald Trump when he came to Scotland. So what? Sometimes if something is funny enough, you just have to do it. Here in the Retail team, we take giving great customer service seriously, though that doesn’t mean we need to lose our sense of humour. We like to inject fun into our work and promotions. 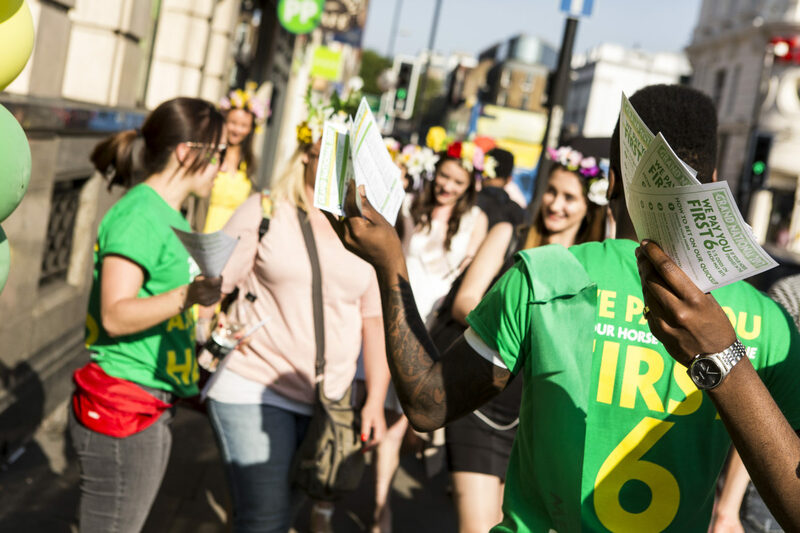 Like the ‘red cards’ we delivered to punters who bet with our competitors during the World Cup. Fair’s fair. Oh, and if you want to dress up as a horse during the Grand National? Well, you can do that too. My name is Laura Sefton and I’m a Shop Manager and District Training Coordinator, so I have two main areas of responsibility. I drive the financial performance of my shop and coach staff to make sure they are acing all the Key Performance Indicators and delivering great customer service! The best part of the job would have to be the people you work with. I have made some lifelong friends over my ten years here. I’ve also been influenced by people who have helped coach me to become the manager I am today. Something I never thought at 18 years old I would be capable of doing. I would say the most challenging part of the job would have to be time management, this is a fast paced industry where changes occur constantly and you have to be able to keep up and manage your responsibilities quickly and efficiently. Would you say Paddy Power is a great place to work? There are many great reasons to work for Paddy Power, the one that sticks out for me would be the incentives that are available — there are always new, different ways you and your shop team can earn these, whether that be hitting targets and receiving a bonus payment, paid nights out, pizza for you and your team and one of my personal favourites, bottles of wine! What’s the career progression like at Paddy Power? Over the years I have worked at Paddy Power I have been able to work in various positions throughout the company. I’ve gone from trainee Cashier, Assistant Manager in London, Assistant Manager in Kent, working in Recruitment & L&D throughout 2016 and now a Shop Manager and DTC. I’ve even managed to throw having kids into that mix at some point! If you could choose a superpower what would it be? There are a number of customers who believe we have a magic “win” button behind the counter which controls their fortunes – if that were true my job would have been a lot easier over the years — but since everybody already thinks we have it, we might as well have it for real. My name is William Coull, I currently work with the Loss Prevention team as a Loss Prevention Investigator. An LPI looks into internal and external losses within the Retail business to try and learn from them and prevent them from happening in the future. 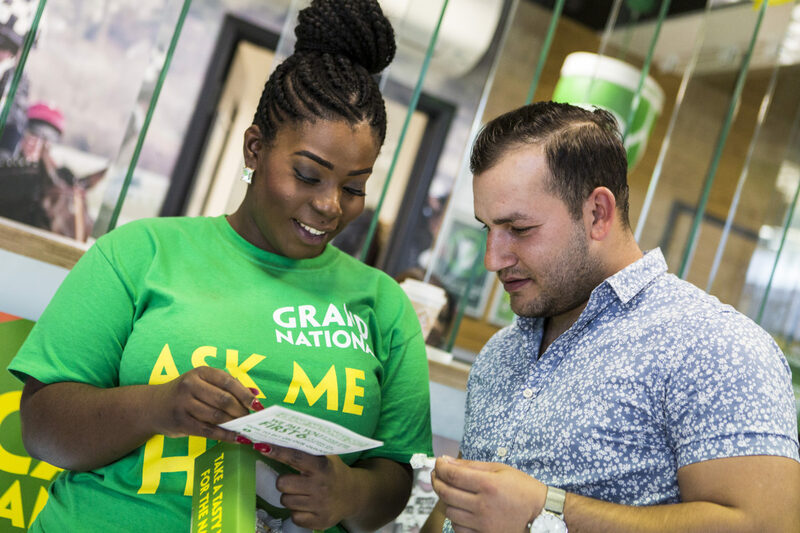 An average day in my job involves visiting Paddy Power stores across London, and conducting a variety of things such as Loss Prevention Assessments, Risk Assessments or investigations with employees. The most enjoyable part of my role is working within an amazing team, who all share different experiences but complement each other well. The most challenging part of my role has to be the traveling. I can sometimes spend a lot of time traveling between sites. 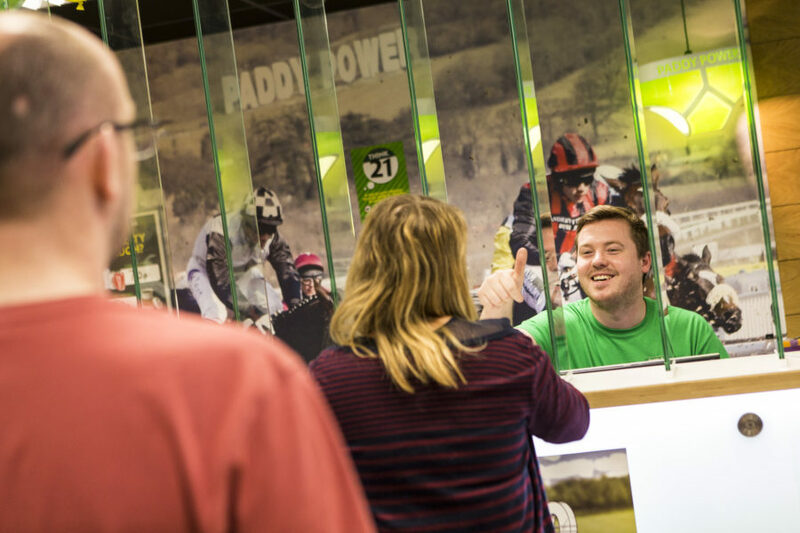 In my opinion Paddy Power is a great place to work because the shop’s are always buzzing with excitement! The staff are amazing and full of energy, but most importantly Paddy always has the customer at the heart of everything they do. The progression was actually the reason I joined Paddy Power from one of their competitors. I joined the company as a Shop Manager in Aberdeen in December 2014, I was then promoted to a Senior Shop Manager within the Scotland district in May 2015. Then after a 12-month spell in-shop, I made the next step into a role within head office as part of Loss Prevention Team. Now I work at the Head Office in London, and I see a lot of other staff just like me coming through from the shops working in a lot of different departments. Which is your favourite PPB company value and why? Relentless Will to Win — this is my favourite value because I think this is the one that best sums up myself, I am always pushing myself to do more and to do things better. People here are always looking at ways to improve and succeed, so it’s a great fit for me. I’m Jennie and I’m currently the Deputy Manager of our shop in Castletymon. That means I’m making sure the shop is run to an impeccable standard, especially in the absence of the Shop Manager. This includes dealing with customer queries, making sure the level of customer service is kept to the high standards, keeping all staff up to date with offers and incentives and dealing with all staffing issues that may arise. Essentially, a deputy manager is there to assist a shop manager with their responsibilities. We are also there to take over when the shop manager is not available for whatever reason. The best bit of this job is most definitely the people you meet along the way. Paddy Power’s staff are the best in the industry, and I think it’s down to the personalities both in the shops and Power Tower. The customers also make it rewarding. No two days are the same because you never know who is going to walk in the door. This can also make it challenging. Luckily, over time I’ve learned how to read people so that makes it easier to figure out the best way to approach them. Paddy Power offer great incentives to the shop staff, so I find it a great place to work. A lot of the time, we get rewarded for just doing our jobs! I also think it’s great that they offer permanent contracts which they honour. That feels quite rare these days. Even if they don’t have your contracted hours for you (which never happens) they’ll still pay you. In my opinion this one is simple, if you’re willing to put the work in you’ll find it easy to move up the ladder. There are so many opportunities that come up. Whether you want to move up within retail or move on to a different department altogether, you never have to wait too long for a position to be advertised. If you could chose a superpower what would it be? I would love to be able to fly. Sitting at a million sets of traffic lights on my way to work is not my idea of fun so this would really solve all those issues… first world problems. Hi folks my name is Anthony Byrne, I’m married with two kids and have a pet dog called Charlie. I’m a District Manager that oversees 32 shops. My responsibilities include rosters, people management to managing the P&Ls. I generally visit 10 to 15 shops a week, to check up on how they’re doing. I also handle emails about Security, HR, L&D and those sorts of things. It’s a fast paced job that requires dedication and an excellent knowledge of the industry. And you always have the time showing excellent people skills, keeping the bright side out as I would call it. The best bit of the job is working alongside our shop staff. Shop staff in my eyes are the core of the industry. Dealing with our customers on a daily basis not just selling a brand but portraying an image. They do an excellent job and are the best in the business. The most challenging? Going through emails. I do it on a daily basis, and I can receive up to 250 a day! My experiences here speak for themselves. I’ve been here for over ten years, but every day is still different, you don’t know who will come through the door of our shops. From Eamonn Dunphy to The Notorious Conor McGregor. And another thing about Paddy Power, is that you feel you can do what is right and they will support you. It allows you to be decisive. I believe there are excellent opportunities to progress within the company. I personally started off as a trainee not knowing anything. I began in my local shop, then went on relief-working in many shops in the south of Dublin, then progressed to Deputy Manager of a city centre shop. From there, I moved onto Manager and then Retail Training for a number of years. In more recent times I’ve joined the District Manager team on a secondment role where I look after 32 shops. So I’ve come a long way here already, and there’s still a lot of places for me to go.